DEAD New thread for Version 2.0+, here. ColorHCFR is a calibration software originally created to be used with the specially designed HCFR probe, by the homecinema-fr Colorimètre team. This is a very pro software and totally free. In order to properly calibrate your TV/Projector you'll need a Colorimeter, a Calibration Software and a Pattern Generator. - XRite DTP-94 (AKA Monaco Optix). - Gretag Macbeth Eye-One Pro. More information in the following post. 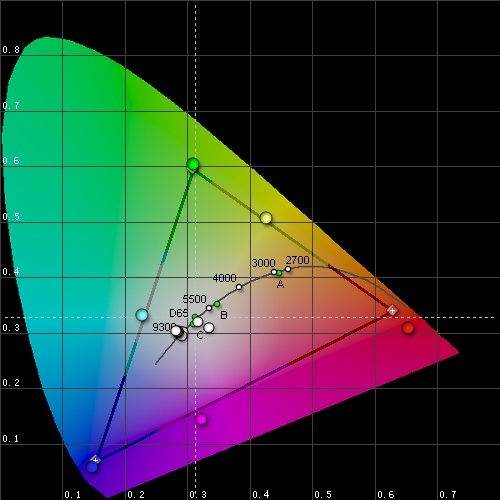 - Download ColorHCFR calibration software. (8MB - Ver. 2.0) more info. This software is distributed under the GNU GPL license. - Download the HCFR DVD with patterns. player isn't compatible with PAL DVDs. Or AVS HD 709 (DVD-5) in order to calibrate with HD DVD color space. Visit www.homecinema-fr.com/colorimetre/index_en.php, for more information. Pros: it's the official and original ColorHCFR colorimeter and totally supported. Really quick readings -maybe the fastest- even in difficult conditions such as low luminance patterns (IRE 10, 20, 30). Cons: it uses a calibration file to properly calibrate. So it may be incompatible with your display/proj. for a while until the file is available. Pros: the cheapest colorimeter. It may be labeled as "entry level" but it's an accurate probe just perfect for the calibrator on a budget. Totally supported. Cons: the slowest, especially in dark patterns. Also inconsistent at those low IRE levels. Price: the colorimeter (hardware) is part of several Colorvision packages. So it starts at $79 msrp in Spyder2 Express. Pros: quite fast, it is a very accurate colorimeter. It even has recalibration (internal offset calculation based on the temperature). The most recommended by the ColorHCFR team. Totally supported. Cons: more expensive than Spyder2 and discontinued, still one of the best. Price: from $219 msrp in Monaco Optix Xr. Pros: since Xrite and Gretag Macbeth merged this is supposed to be the replacement for the DTP94. Probably as good as the Xrite. Now fully supported. Cons: also more expensive than Spyder2. Price: included in several packages. From $170 msrp in Pantone Eye-One Display LT.
Pros: really accurate, unlike the others (which are filter-based) this is not a colorimeter but a spectrophotometer. As it's name implies this is a more professional tool (needs to be recalibrated regularly). Totally supported. Cons: really expensive, not necessary better than a good filter-based colorimeter in real world calibrations. Price: did I say expensive? From $1095 msrp in Eye-One Beamer. When using S2Fly, does the program take into account the blue filter on the Spyder2 when LCD/Projector is selected. Or should the filter be removed for all readings? But it doesn't especify that. Install the application in French, than overwrite the .exe file in the program directory with the one attached in the .zip file. *EDIT* Apparently, I can't attach the file because it is too big! Anyone have any suggestions? Okay everybody, here it is! Install the application in French, than overwrite the .exe in the program directory with the one in the .zip file. TRANSLATED: Menus, Toolbars, Dialog Boxes, Tooltips, Status, Preferences, Application Information, etc. P.S. If anyone has any translation suggesstions, like maybe things I translated wrong, or things that should be named differently, let me know and I will change them promptly. P.S.S. There were certain things, such as, text inside drop-down boxes that I coud not find an edit for. So, I could not translate these, if anyone has any suggesstions on how to translate these parts, let me know. Good find and thanks for the work onthe translation! Thanks. Has anyone compared this software's results to any of the other software suites using the spyder2 colorimeter? It should work properly, if not delete cookies and try again. Remember to click on "Free". Nope. Dumped the cookies and hit "Free" (as before) but still get "The page cannot be displayed" message. I don't know, it is still working here. Anyway, download both .txt > rename to .rar > unrar. Have anyone burned the DVD? I cannot get it to burn to DVDRW with Nero Express 6! Seems to be an Archive not an ISO Image. I've opened it with winrar and got a dvd file structure. so maybe you should unrar it and put the files on your dvd. Yep, it worked that way. Thanks. If anyone is interested in authoring a HDDVD (with Movie Factory 5, for example) click here to download the patterns in 1920x1080. More info in french forum. Yes. I compared my results to CalMan and Rader's spreadsheet, they are identical. However, each package has it's benefits. CalMan requires Excel, but takes measurements directly from the meter. Rader's sheet is not as accurate, but is free. This software requires no 3rd party applications, it's free, but I have not figured out a way to take measurements directly from the meter. I know their is a way, but I haven't figured it out yet. Also, I hope someone can give me some recomendations for translations. I have a feeling some of the translations could have been better. Location: how should i know your location ??? Yes. I compared my results to CalMan and Rader's spreadsheet, they are identical. Just overwrite your existing .exe file with this newer one. There is still a lot to be done, but it's getting better. I need suggesstions on translations though. Keep in mind, I don't know French, this was all done with BabelFish and my own knowledge of display calibration. Thanks.... and keep up the good work!! Thanks for all of your works. Finally I can make some pro-looking graphs.Just like the attached file. Not perfect, but pretty close . Typing values directly in fields can make it work to have good graphs, but it's far from using the application with the colorimeter Anyway, we are looking to other devices, and maybe one day you could use it with easy to buy devices. Hey Georges, it would be great if you can make it work with the Spyder Colorimeter. Contact me and I'll provide you with the API details. According to colorvision the filter should always be on regardless of the displaytype. And I might mention that I never undeersttood the "CRT"-mode. The values is on par with the ones reported from Spyder2 Pro colorimeter, but the values themselves are very strange.. I always use filter (baffle) on, LCD/Proj mode.